"Hermaeus Mora, hearken to the plea of this unworthy, for I come to barter for knowledge denied. That which I seek is named on this parchment, which I consume in your honor, O Demon of Knowledge. For my desire to know is beyond reckoning, and in recompense, whatever price is named shall be met." Rootwater Grove is a bog in western Greenshade, east of Woodhearth. The Grove is usually warded such that it blends seamlessly into the forest except to those woven into its wards. The Grove exists to conceal the Cradle of Ilmyris, a library of secret knowledge kept by a cult of Herma-Mora, the Wooded Eye. 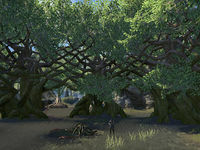 The wards both bind and are powered by Daedra, who guard the grove and the Cradle. Souls of individuals of every major race contribute to the binding of the Daedra to this purpose. Rootwater Grove Objective: Restore peace to Rootwater Grove. 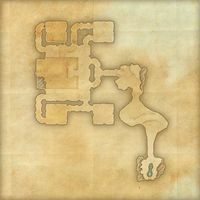 Ilmyris is an Ayleid ruin hidden within the wards of Rootwater Grove. The Cradle of Ilmyris holds the Vault of Memories, a library of secret knowledge possessed by the Wooded Eye, and a shrine to Hermaeus Mora. 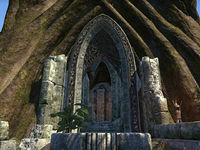 The Cradle also contains at least one Ayleid 'memory' crystal, which encapsulates memories or information on the Ayleid kings Gordhaur the Shaper, the Fire King Hadhuul, Haromir of Copper and Tea, the Flower King Nilichi, and Umaril the Unfeathered.